Introducing Glee Soundtrack, the newest member of the Gleekdom! The Gleekdom is very pleased to announce two new members to our crew! Last week, Rachel from Gleehab introduced Dana from WTF Glee!? !, and I’m now super excited to introduce you all to Tanya from Glee Soundtrack! Tanya’s awesome site fills a horribly gaping void in our blog network, because although one of the key features of Glee is its music, none of our sites truly gave the show’s awesome songs their due coverage! 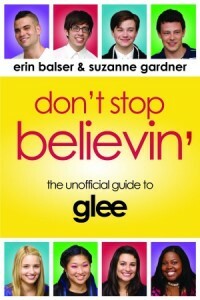 On Glee Soundtrack, Tanya previews and reviews the songs from each episode, reviews all of the Glee albums, and discusses what songs she wants to see on the show. Basically, if you’re like me and you love to listen to Glee songs on repeat on iTunes (or “the iTunes,” as Terri calls it! ), this is definitely the blog for you! Tanya will keep your Glee music needs totally satiated. If you haven’t already, please go take a look at both Glee Soundtrack and WTF Glee!?! Welcome to you both!